The Eastern PA Coalition for Abandoned Mine Reclamation will hold its annual Fall Cleanup Event in Centralia, Columbia County on October 20. 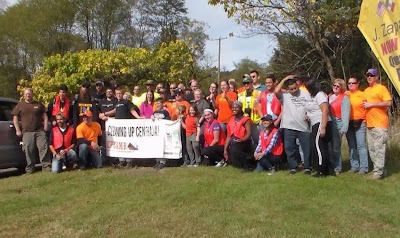 EPCAMR will once again bring together cleanup partners and volunteers, old and new, back to Centralia to pick up where the illegal dumpers have left off. -- Graffiti Highway (from the top to the bottom and over the guardrails). Cleanup organizers are seeking donations to use during the cleanup, including pickup trucks, JEEPS, and of course, any refreshments, water, chips, food donations for lunch to be sure to feed everyone. EPCAMR has already secured $1,750 towards the cleanup through an Anthracite Region Independent Power Producers Association Grant that has been a long-term partner. The group is also expecting to receive additional financial support from Joe Sapienza, Director of the recently released documentary and dumpster donations from Mostik's Disposal. EPCAMR will also be sharing this event with the surrounding regional colleges who have partnered with them in the past. EPCAMR would like to obtain t-shirts for cleanup volunteers in a safety orange/black color similar to those worn by EPCAMR staff. They will be looking for sponsors and logos for the shirt. ALL volunteers and organizations interested in participating must sign a waiver to participate in the event for liability reasons. Signature pages will be available from EPCAMR. Children under 14 must be accompanied by an adult, be supervised at all times, and sign on their behalf. Volunteers are required to attend a mandatory safety briefing before the event starts. For more information, contact Robert Hughes, Executive Director of EPCAMR at 570-371-3523 or send email to: rhughes@epcamr.org. More information on programs, initiatives, other upcoming events and how you can get involved, is available at the Eastern PA Coalition for Abandoned Mine Reclamation website.